60 total news articles in this section, 10 per page. 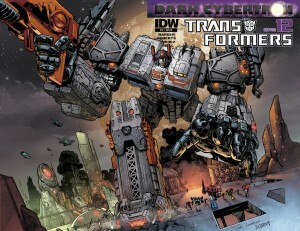 Comics and entertainment website Newsarama has posted an article on the ongoing collaboration between Hasbro and publisher IDW. In the piece, senior editor and Robots in Disguise co-writer John Barber and Hasbro's director of publishing Michael Kelly look upon the current work produced by the two companies, ranging from My Little Pony to G.I. Joe to, of course, Transformers. You can read the whole piece here, and some snippets below! IDW Senior Editor John Barber describes the partnership as “a nice relationship of trust and mutual respect” built over the past eight years and the successes’ IDW has had with the properties. Barber, who worked previously at Marvel guiding titles like Wolverine, Stephen King’s Dark Tower and the Ultimate line, says that there’s a misconception about the differences between licensed comics and comics owned in-house. Some economic discussion had already started in the past few days, but it seems we are not alone: William Bias, of The Motley Fool has written a relatively short piece on Daily Finance, discussing some options that Hasbro could consider to increase its revenue. His suggestions? Bring back G1 and prepare a live-action series. Read more about it below! Hasbro experienced great success with its live action Transformers movies over the past six years driving an increase in revenue following their releases in 2007, 2009, and 2011. However, its revenue then suffers in subsequent years as the euphoria from the previous movie slowly wears off (chart below). So far in 2013 Hasbro's revenue remains roughly even with the same time last year. However, Hasbro can do two important things to help boost revenue during the down years between blockbuster movies. Hasbro along with The Hub, its media outlet jointly owned by Discovery Communications , needs to follow in the footsteps of Walt Disney and Time Warner in creating adult targeted live action television series. Walt Disney's Agents of SHIELD serves the purpose of raising brand awareness for the Marvel based brands despite the ratings slump. Fellow Fool Leo Sun cites the show's construction on "faulty 1990s logic" or a monster of the week scenario for the show's waning popularity. Joss Whedon's creative team behind this show certainly possesses the talent to turn Agents of SHIELD around if necessary, as evidenced by later Buffy: The Vampire Slayer seasons where the audience saw more depth in its characters due to choices made under difficult and unusual circumstances. Time Warner and 21st Century Fox's contributions to the bandwagon include a Batman Prequel called Gotham, Arrow, and its spinoff Flash. Along those lines, a live action Transformers or G.I. Joe television show would go a long way in boosting toy revenue in between movie years. While well written animated series such as Transformers Prime are great, they generally are viewed by children limiting the scope of popularity. It's difficult to write an intelligent series geared toward that audience. A live action Transformers television series would probably be expensive ; however, the studios could produce short seasons in a Game of Thrones fashion. G.I. Joe would certainly prove feasible for Hasbro's studio partners. Walt Disney and Hasbro appeal to the nostalgic collector by releasing toy lines such as the Star Wars: The Black Series and reissuing old Star Wars toys. Moreover, Hasbro occasionally releases a Transformers Generation 1 reissue geared toward people who enjoyed Transformer's original line in their childhood. Hasbro could take this a step further and produce an animated (not computer generated) series that picks up where it left off during the second season in 1986 bridging the gap between that time period and the animated classic Transformers: The Movie. An hour long show with a shortened season could conserve on costs. A good working title: Transformers 1980s. 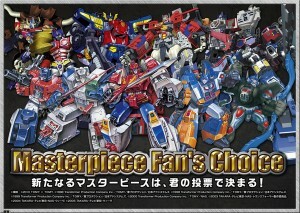 Hasbro could also do a spinoff series that centers on post Transformers: The Movie characters such as Headmasters . Next year marks the 30th anniversary of the release of the first Transformers line and the release of Transformers: Age of Extinction, the fourth live action Transformers movie. A direct-to DVD Transformers Prime animated movie and a new animated series is also rumored to be in production for release later next year. Hasbro and Hub need to think past next year and put forth some larger revenue generating initiatives like the ones highlighted above or its revenue will likely suffer in 2015. 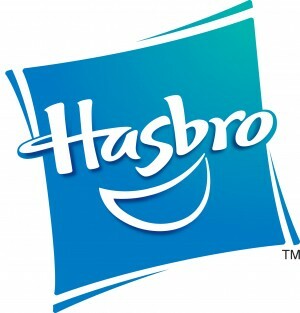 PAWTUCKET, R.I.--(BUSINESS WIRE)-- Hasbro, Inc. (NASDAQ: HAS) announced that its Board of Directors has declared a quarterly cash dividend of $0.40 per common share. The dividend will be payable on February 18, 2014 to shareholders of record at the close of business on February 4, 2014. We've received a recent press release presenting the collaboration between Hasbro and SmarTots, a China-based company dedicated to the development of educational apps for iOS and Android systems. The two companies will be creating a series of apps for children, using Hasbro's franchises, including our own favourite transforming robots! Check out the full press release below. BEIJING, Dec. 10, 2013 -- SmarTots, a leader in mobile learning games for kids, and Hasbro, the international toy manufacturer, are partnering to create a new coloring experience for three- to six-year-olds on the iPad. With the new Transformers coloring game, developed by SmarTots for iOS, kids can use a variety of art tools to color in and decorate their favorite Transformers characters. The app seeks to cultivate creativity, and kids can express themselves as neatly or messily as they want! "Transformers is one of the most exciting brands that we could imagine working with. We're thrilled to be creating a kid-friendly product using these renowned characters," says Jesper Lodahl, SmarTots CEO. "Our creative art apps are very well received by kids and parents alike, and adding Transformers to the mix adds a whole new layer of appeal." SmarTots is also developing apps for other Hasbro brands like My Little Pony and Tonka, with plans to release in them in near future. The creative art apps currently offered by SmarTots have already amassed over 1 million downloads (according to App Annie). This is due in part to the upward trends of the Chinese mobile market in both the gaming and education categories. According to a recent survey of parents in Beijing, Shanghai, and Guangzhou, a colossal 49.6 percent of parents would use a mobile device to teach their children. Hardware manufacturers like Samsung are also tapping into the kids space as products like the Galaxy Tab 3 Kids, a tablet designed to be used primarily by young ones, come to the market. SmarTots is a developer, publisher and platform for kids' apps on iOS and Android. The company's mission is to change the idea that learning and fun are separate concepts. Every SmarTots app strives to stimulate the curiosity and creativity of kids, to engage and educate. SmarTots is a Softbank backed company based in Beijing, and is active in the China market. The company was founded in 2010 by Jesper Lodahl of Denmark and Victor Wong of Canada. Hasbro, Inc. is a branded play company dedicated to fulfilling the fundamental need for play for children and families through the creative expression of the Company's world class brand portfolio, including TRANSFORMERS, MONOPOLY, PLAY-DOH, MY LITTLE PONY, MAGIC: THE GATHERING, NERF and LITTLEST PET SHOP. From toys and games, to television programming, motion pictures, digital gaming and a comprehensive licensing program, Hasbro strives to delight its global customers with innovative play and entertainment experiences, in a variety of forms and formats, anytime and anywhere. The Company's Hasbro Studios develops and produces television programming for more than 170 markets around the world, and for the U.S. on Hub Network, part of a multi-platform joint venture between Hasbro and Discovery Communications. Through the company's deep commitment to corporate social responsibility, including philanthropy, Hasbro is helping to build a safe and sustainable world for future generations and to positively impact the lives of millions of children and families every year. It has been recognized for its efforts by being named one of the "World's Most Ethical Companies" and is ranked as one of Corporate Responsibility Magazine's "100 Best Corporate Citizens." Learn more at http://www.hasbro.com. 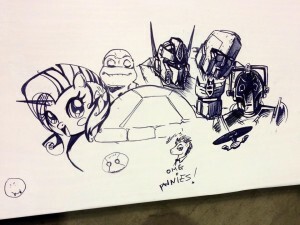 In an effort to increase the bids on the various charity auctions, IDW Publishing have teased an image of an extra incentive, a reward for the overall highest bidder on the exclusive sketch covers! Take a look below, and browse the auctions here. We've got a special surprise for the highest overall bidder in our charity auction courtesy of Sara Richard, Dan Duncan, Livio Ramondelli, J.K. Woodward & D.J. Kirkbride. Through their official Facebook page, IDW Publishing have advertised that they are currently raising funds to help people affected by the Haiyan typhoon a couple of weeks ago. 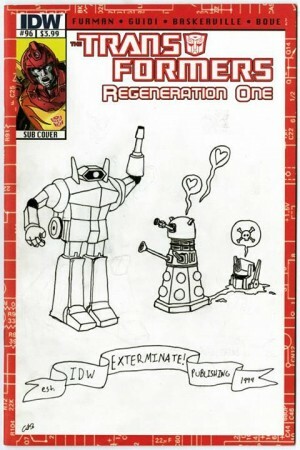 In order to do so, they are auctioning off sketch cover variants of their current comics, including Transformers: ReGeneration One 96! You can find the auction here, and the cover sketch mirrored below. As Thanksgiving approaches, the IDW family would like to take the time to thank all of our fans for their support and give to those affected by Typhoon Haiyan. Therefore, we are holding an eBay auction for the one-of-a-kind custom sketches by IDW staff members on the Artist's Edition blank SUB covers. All proceeds will be donated to Typhoon Haiyan relief efforts. Click here to enter your bid http://bit.ly/1c5rydD and thank you. IDW Publishing have just let us know they will be descending upon Long Beach Comic Con for the fifth year running this weekend, and Transformers artist Livio Ramondelli will be signing at their booth! Check out details below. 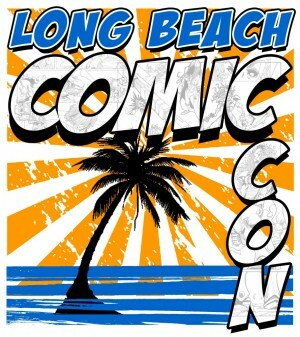 San Diego, CA (November 21, 2013) – IDW will once again return to the Long Beach Comic Con over the weekend of November 23rd & 24th. The schedule will be packed with impressive signings, and a great panel full of surprises and giveaways. On Saturday November 23rd from 2:00 PM – 3:00 PM in room 102C IDW’s VP of Marketing Dirk Wood and Senior Editor Scott Dunbier will host The Panel of Doom with a rousing discussion where all burning questions will be answered! Plus, be prepared to win some amazing prizes while getting a peak at what’s to come from IDW! Be sure to swing by IDW’s booth, #207 for all of these amazing signings, and stock up on all things IDW! Posted by: Va'al | Credit(s): Hasbro, Nike Inc. Courtesy of Hasbro, we have additional information about the release and pricing of the 'Megatron Rises' exclusive set of Nike shoes and action figure: apparently, some of the items will be available separately, as well as part of the box set, but not the redecoed Megatron toy. Check out the details below, and make sure to check out yesterday's news story for the full gallery! -- All "Megatron Rises" items will be available as of November 26 with the "Megatron Rises" Box set available a few days earlier in limited quantities only at 21 Mercer in New York City. -- Outside of the "Megatron Rises" Box set, the special edition Megatron Transformers figure will be sold as a promotional item with the CJ Trainer Max Megatron (Calvin's signature shoe) ONLY. It is only available with purchase of that particular model. 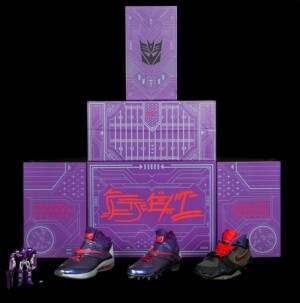 NikeInc.com have uploade a press release to describe the recently shown Nike Air Megatron Trainer, and the Calvin Johnson Jr Megatron action figure by Hasbro, based on the Generations IDW Deluxe Megatron toy. Check out what they have to say below, including an extensive promotional gallery of the two items! 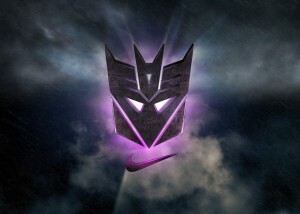 Nike Football champions the TRANSFORMERS “More Than Meets the Eye” qualities of Calvin Johnson, Jr. by teaming up with Hasbro on the Nike CJ81 Megatron Trainer Max. As a special addition, the Nike CJ81 Megatron Trainer Max is sold with a first ever Hasbro TRANSFORMERS action figure designed for an athlete in conjunction with a shoe release. Calvin Johnson, Jr. has redefined the wide-receiver position and become an un-guardable force with a powerful nickname - MEGATRON. Like the fictional TRANSFORMERS DECEPTICON leader, Johnson taps into his superhuman-like skills to push the limits of his position, and the game, in a relentless quest for dominance. Designed to amplify Johnson’s powerhouse athletic ability when training in the gym and on the turf, the Nike CJ81 Megatron Trainer Max features adaptive traction, lockdown support, and Max Air cushioning. In true MEGATRON form, all core attributes of the shoe are energized in a design that marries Johnson’s on-field persona with his human side. The Nike CJ81 Megatron Trainer’s purple upper gives the shoe a robotic, armored look, while the red accents refer back to the secondary color of the action figure. Under the forefoot strap, Johnson’s favorite MEGATRON quote, “Show no mercy,” appears. It’s a reminder of the athletic mindset needed to succeed at the highest level, and the perseverance required to rise to the top. The metallic silver heel of the trainer carries a classic TRANSFORMERS grid pattern as well as a bold, iconic DECEPTICON logo at center. Complementing the Nike CJ81 Megatron Trainer Max, the Megatron Nike Air Trainer SC II draws more muted inspiration from the TRANSFORMERS character. A tonal, reflective circuitry board pattern is featured on the medial and lateral quarter panels, and like the Nike CJ81 Megatron Trainer Max, the DECEPTICON logo appears welded at the heel. Premium Nubuck is used at the overlays, and a glow-in-the-dark outrigger punctuates the sole tooling. The final TRANSFORMERS inspired flourish is a removable strap across the upper. In further celebration of Johnson’s athletic achievements, the limited edition Megatron Rises 3-Pack incorporates the Nike CJ81 Megatron Trainer Max, the Megatron Nike Air Trainer SC II, and a special edition Nike CJ81 Megatron Elite TD Cleat. Inspired by the ALLSPARK from TRANSFORMERS lore, the box of the Megatron Rises 3-Pack is a unique, converting cube-shaped design. Decorated entirely with original artwork, the lines of the box mimic robotic surfaces and are augmented by triangles, hash marks, x’s, and o’s in reference to the football field and offensive passing plays. The effect is, like Calvin Johnson, “More Than Meets The Eye” - a package that opens to reveal all three shoes and the Hasbro action figure. Exclusive to the Megatron Rises 3-Pack, The Nike CJ81 Megatron Elite TD shares the same MEGATRON-inspired design as the Nike CJ81 Megatron Trainer Max and celebrates Johnson’s true dominance of the receiver position. The cleat combines natural motion with superior lockdown to allow Johnson’s full athletic ability to flourish. In honor of Johnson’s number, 81 Megatron Rises Packs will release exclusively at 21 Mercer in NYC, select Nike Yardline doors, and Nike.com. The CJ81 Megatron Trainer Max and the Megatron Nike Air Trainer SC II will be available at select Nike retail locations and online at nike.com. MEGATRON is a trademark of Hasbro and is used with permission. © 2013 Hasbro. All Rights Reserved. Licensed by Hasbro. Also shown were a couple of Star Saber's character models from the Victory series. It is highly possible that this is the look that Takara Tomy wants to achieve with this Masterpiece figure. Stay tuned to Seibertron.com for further details as they become available. 4,326 pages were recently viewed by 594 unique visitors. This page was viewed 1 times on Friday, April 26th 2019 12:47am CDT. © 2019 Seibertron, Inc. DBA Seibertron.com. All Rights Reserved. Established June 2000. Seibertron.com is owned by Ryan Yzquierdo.